GITEGA / KAYANZA / KIRUNDO January 28th (ABP) – The President of the Republic of Burundi, President of the Higher Council of Elders and Permanent Guide of the ruling party, Mr. Pierre Nkurunziza with his wife Reverend Pastor Denise Nkurunziza, honored with his presence on Thursday in Gitega (center), the opening ceremonies of an Ecumenical Crusade of thanksgiving to God for His grace to Burundi organized in Gitega by the CNDD-FDD party at the central level, under the theme: “For where your treasure is, this is where your heart is”. Other dignitaries of the country and party leaders including Secretary General Evariste Ndayishimiye; National Assembly Speaker Pascal Nyabenda; Senate President Révérien Ndikuriyo; Ombudsman Edouard Nduwimana; government members; parliamentarians; representatives of religious denominations and civil society organizations; a crowd of ruling party activists; choirs of various religious denominations and the people of the surrounding communes of the provincial headquarters of Gitega, also attended that three-day Crusade. 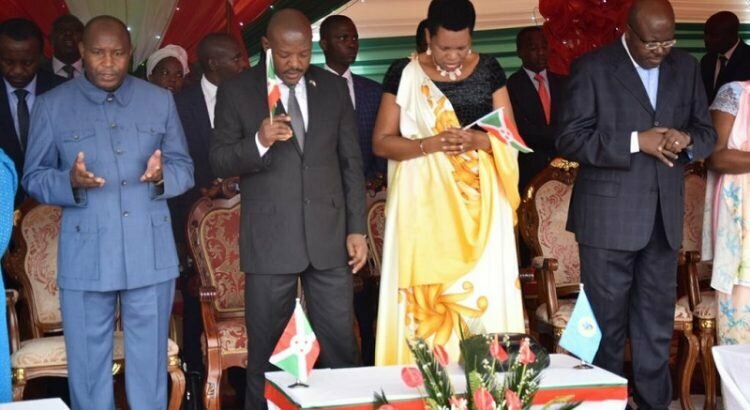 The ceremonies began with an ecumenical prayer by the representatives of religious denominations who, in turn, paid a heartfelt tribute to God for the various wonders he keeps filling Burundi. They also implored God’s blessing on the leaders of the country and its people. In his message, President Nkurunziza invited the CNDD-FDD party activists (bagumyabanga) and Burundians in general to always give primacy to God who is the guarantor of all human life, protector and source of all wealth. He took the opportunity to thank God for the peace and security that reign throughout the country and for its riches. He expressed his satisfaction for that ecumenical prayer which coincided with the day of Thursday, devoted to prayer and fasting instituted on 18 August 2017 in Gitega. He invited the participants to take advantage of that opportunity to express their gratitude to God for his incalculable gifts. He also called on them to examine their consciousness to implementing the commitments made during the meeting of last year. The Head of State also called on the participants to contribute to the construction of the temple of God to be built in Gitega, the new political capital of Burundi. 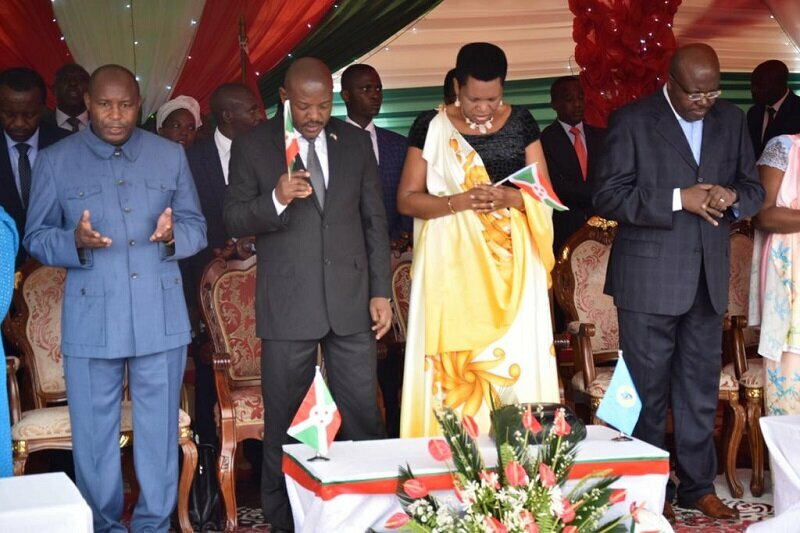 Ruling Party Secretary-General Evariste Ndayishimiye said the prayer was organized to praise and give thanks to God who has always kept Burundi even during the difficult times this country has gone through. It is also a framework for renewing this party’s commitment to the primacy of God in its various actions. He invited everyone to evaluate their daily actions to see if they really meet the divine will, especially in the management of public good. The evangelist of the day, Ms. Denise Nkurunziza and wife of the Head of State, meant that only God is the source of wealth and it is himself who gives it. She thus advised the participants to break with any temptation to poorly acquired wealth. She decried some people’s attitudes of accumulating unjustly acquired wealth. She invited the rich to help the poor and to help build the temple of God. In Kayanza province (north), CNDD-FDD party members organized the same prayer in the hall of the provincial party’s office under construction. The provincial secretary of the CNDD-FDD party, Mr. Ferdinand Habimana, said that this kind of prayer allowed the said party to reach a satisfactory step. He said that food and cash offerings have been collected to assist vulnerable people. Mr. Habimana also asked the Bagumyabanga not to highlight the positions to occupy after the 2020 general elections, but rather to work together, while avoiding anything that could be the cause of internal divisions within the party. A pastor urged Kayanza’s bagumyabanga and bakenyererarugamba to cut short with sin, but rather to favor the good. In Kirundo (northern Burundi), the CNDD-FDD party activists gathered in Kagege village of Busoni commune on Wednesday January 23, 2019 to thank God for all the blessings they received, a check by ABP revealed. According to the provincial secretary of the CNDD-FDD party in Kirundo province, Mr. Fabien Bizumuremyi, it was the day by which they decided to raise the name of God who blessed the CNDD-FDD party and the Bagumyabanga. He gave the example by which this party surprised the world by winning the 2005 elections, as it emerged from the rebellion, saying the CNDD-FDD party was undoubtedly honored by God. The 2015 coup was also mentioned, saying it failed thanks to God through the order forces, while the President of the Republic was abroad. M. Fabien said that he who was chosen by God was never conquered by his enemies; this has been the focus of pastors in their divine words. On that occasion, the Bagumyabanga made offerings to thank God; all the communes of Kirundo province were able to collect 11,084,000 BIF and more than 35 tons of food. That money will contribute to the construction of the Gitega temple, while the food will help the vulnerable.